Yehezkel Raz is a producer from Tel Aviv who is starting to really make waves in the saturated Israeli progressive scene. Those guys really know their onions, and with the likes of Guy Gerber, Sahar Z and Lonya among the glitterati, you quickly realize the quality on offer. Friday Lights is a digital label from Israel and releases Techno/Minimal Sounds. Established in 2011 by Igor Ilgiyaev, his vision was to choose exceptional music with a unique emotional style. 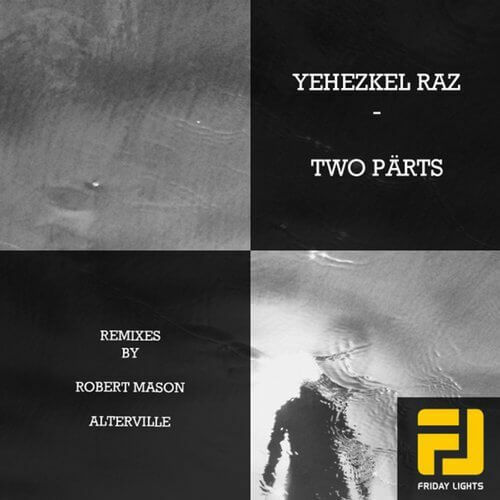 Remixes come from Israeli duo Alterville and Canadian Robert Mason. The original track certainly falls into the unique and emotional end of the spectrum. Ambient drones and pianos soon make way for a double-time drum and more Vangelis like synth work creating a deeply satisfying, sonically rich layered piece. A German-sounding voice penetrates the blanket of pads and keys with a response to an unasked question regarding music adding to an overall feeling of otherworldliness. Ido and Ori (Alterville) represent a lifetime spent together DJing and making music which inspires them. Drawing from the smorgasbord of musical delights Isreal has to offer, their sound is a combination of Ido’s love of leftfield sounds and Ori’s rock drummer past. Their remix aims in part to marry their disparate loves with the gorgeous original to make it more dancefloor orientated. Industrial and tribal, it powers along with added emphasis from the sparse arrangement given to the excellent percussive parts. Neat snare hits give it a rolling vibe and I’m instantly thinking about other tracks to put around it in a mix. Perfect mid-set warm-up material for the deep trance/progressive crowd. Canada’s Robert Mason has been on fire of late. And with solo material climbing the Beatport charts as well as a string of hits with long-term girlfriend Amber Long, this guy is certainly going places. Again, very much keeping with the vibe of the original, Robert opts for a deeper take than the Alterville boys, and in doing so really ups the ante. With his trademark rolling bassline, something of an indication of his minimal past as Mason Bach, he sweeps us up in a maelstrom of deep progressive goodness. The break seems to come for nowhere and its chilled nature belies the second half of immense power and creativity. A classically trained musician, flecks of a violin can be heard flitting in and out of the mix adding subtle nuances to an already heavily nuanced package. Definitely one of those secret weapons packs normally reserved for the stars of the scene. Its out now, so do yourselves a favor and pick this up today!